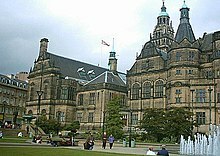 Sheffield is a city and metropolitan borough in South Yorkshire, England. Historically part of the West Riding of Yorkshire, its name derives from the River Sheaf, which runs through the city. With some of its southern suburbs annexed from Derbyshire, the city has grown from its largely industrial roots to encompass a wider economic base. It is one of the eight largest regional English cities that make up the Core Cities Group. Sheffield is the third largest English district by population. During the 19th century, Sheffield gained an international reputation for steel production. Many innovations were developed locally, including crucible and stainless steel, fueling an almost tenfold increase in the population during the Industrial Revolution. Geoffrey Chaucer, "The Reeve's Tale", in The Canterbury Tales, (1297). Daniel Defoe, A Tour Through the Whole Island of Great Britain, (1724). William Cobbett, Rural Rides, (1830). John Parker, Parliamentary Select Committee on Public Walks: Minutes of Evidence (1833), quoted in Clyde Binfield et al, The History of the City of Sheffield 1843-1993: Volume One: Politics, (1993). Walter White, A Month in Yorkshire, (1861). There is no more public spirit in Sheffield than there is in the smallest village of Yorkshire. Thomas Moore, Sheffield Independent, 16 April 1870, quoted in Clyde Binfield et al, The History of the City of Sheffield 1843-1993: Volume One: Politics, (1993). Anthony John Mundella, letter of October 1871 to Robert Leader, quoted in Clyde Binfield et al, The History of the City of Sheffield 1843-1993: Volume One: Politics, (1993). Petition for city status to Queen Victoria from Sheffield Town Council, 1 February 1893. Frederick Mappin, 1905, quoted in Sidney Pollard, A History of Labour in Sheffield, (1959). George Orwell, The Road to Wigan Pier, (1937). Sheffield is fortunate to have one of the strongest green structures of any city in the UK. This green structure, which at its core is linked by watercourses, underlies the City. The effectiveness of the river system as the core of the green structure is supplemented by: the agricultural area, the moorland, the woodlands and water features which lie outside the built-up area. The public open spaces within the built-up area and extensive private gardens, which cover much of the surface of the City outside its core area, are also linked to this system. All the features of the green structure in effect work together to make the City more environmentally sustainable: for example, together they act as a sponge to reduce flash flooding; they support a relatively high level of biodiversity, particularly because of the extent of the gardens and the existence of the natural corridors along the rivers; the valleys drain cooler air down from the hilltops towards the city centre and the industrial areas beyond, improving air quality and also temperatures in the summer in the built-up core. This page was last edited on 28 July 2014, at 17:48.